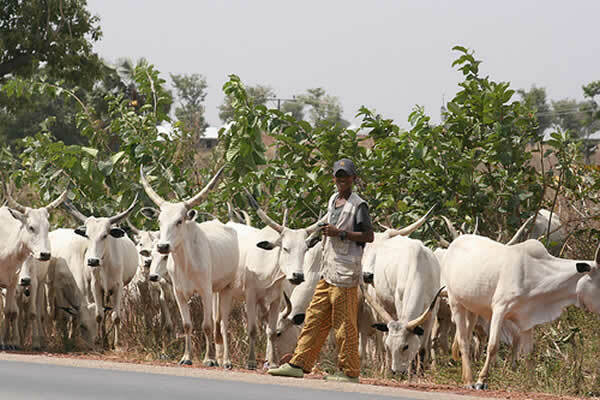 A herdsman on Friday sustained bullet wounds in an attack on a Fulani cattle rearers’ settlement in Aku, a community in Igbo-Etiti Local Government Area of Enugu State. Our correspondent learnt that three other herdsmen are missing in the wake of the attack, which was reportedly carried out by youths of Aku community. It was gathered that the relationship between members of the community and the herdsmen had been tense for a long time due to misgivings on the part of the villagers over the destruction of their crops by cows. It was also learnt that the herdsmen, who are usually armed, have been harassing the villagers. A 17-year-old herdsman, identified as Wareri, sustained three gunshot wounds during the attack. Three other herdsmen, said to be Wareri’s siblings, are said to be missing. Wareri’s father, one Alhaji Sodu, also a herdsman, identified his missing children as Musa, Baba and Muhammed. Sodu said about 100 cows in his herd were scattered in different directions during the attack, and are currently missing. Meanwhile, chairman of a security committee set up by the Enugu State Government to address herdsmen menace in the state, Brigadier General Fred Eze (rtd. ), also on Friday visited the injured herdsman at a hospital in the 9th Mile Corner, where he is receiving treatment. The victim’s father, Alhaji Sodu, who was at the hospital during the visit, appealed to security agencies to rescue his sons. “I am too old now to go into the forest in search of my three sons, I am appealing to security agencies to rescue my sons unharmed. “The youths have slaughtered seven of my cows. “Over 100 cows are missing now,” he said. Speaking during the visit, Eze urged restive youths in various parts of the state, who are furious over the activities of the herdsmen, to avoid reprisal attacks. He said security was beefed up in the affected area to forestall further violence. “We want to allay fears generated by this incident, the army has moved to forestall any breakdown of law and order. “The Garrison Commander, O.T Akinjobi, has dispatched a search party for the missing kids. “Another combined team of police and the army have equally moved into the area to avert any breakdown of public peace,” he said. Eze added that the incident is being investigated. Civil disturbances involving herdsmen have been on the rise in Enugu State, where cattle rearers have makeshift settlements in several communities. Over 20 persons died when herdsmen invaded Ukpabi Nimbo, an Enugu community, on April 25. A Catholic seminarian and a housewife died in a herdsmen attack on Attakwu, another community in the state, on August 25.